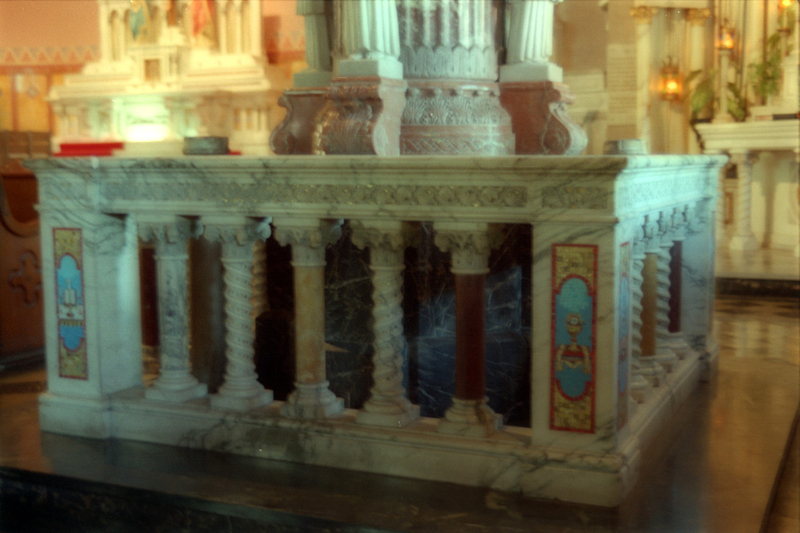 We propose to furnish Marble Pillar and Base, also Railing and Platform, the four Marble Angels and the Statue of St. Ann in special rich decoration, as per design submitted and specifications attached, for the sum of Twenty Nine Hundred and Thirty Five Dollars ($2935.00) all set up complete in St. Ann’s Church at Page and Whittier Streets, St. Louis, Missouri. This to include the necessary foundation work under the floor line to support this Shrine, also the four petition boxes in the corner posts and the boring of a hole thru the main Pillar for the electric wiring to the top of the Cap. SPECIFICATIONS FOR STATUE, PILLAR AND RAIL OF ST. ANN’S DE BEAUPRÉ TO BE PLACED IN CENTER AISLE OF ST. ANN’S CHURCH. Total height overall including Statue is 16 feet 9 inches. Height to top of Cap from floor line is 11 feet 3 inches. Platform 7 ft. × 7 ft.
Railing 2 ft. 4 in. high. Standing Angels 2 ft. high to top of head. 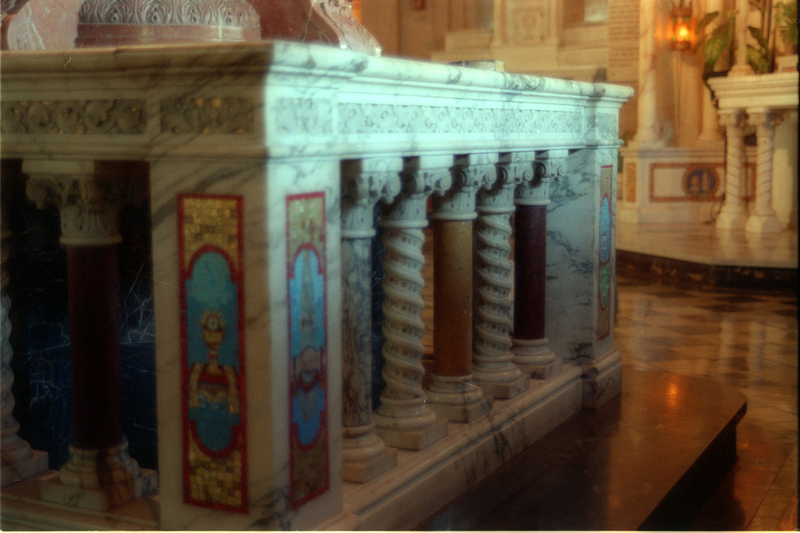 This pillar is to be constructed of specially selected beautiful marbles so as to give it a most handsome and rich appearance of individual elegance. The round smooth column part to be of a beautiful selected Italian Onyx of rich color and a highly polished finish. The Cap carved in Champville marble and resplendently illuminated with Venetian gold mosaic set in between the carvings. The Plinth and top base of Pillar, also the bases on which the Angels rest, all carved in selected Convent Sienna Marble of rich veining and texture and illuminated with Venetian gold settings. The Base proper of richly veined black and gold (Portero) marble. 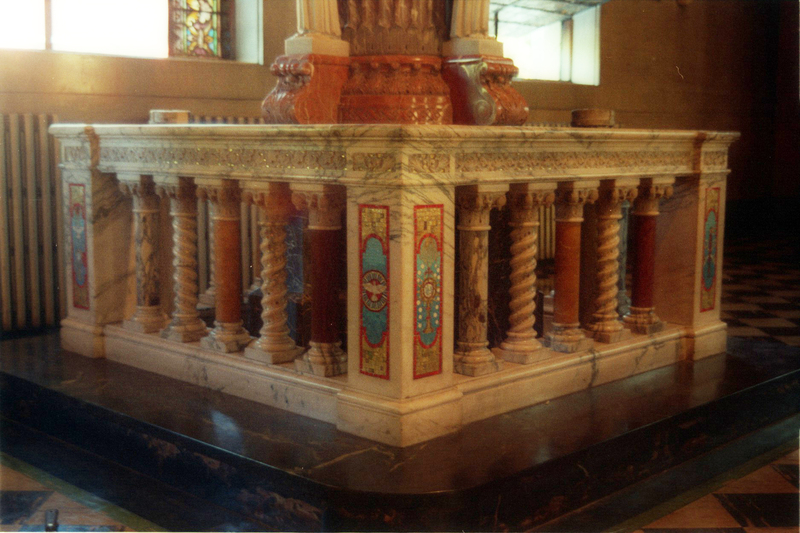 The Railing which goes around the Pillar on four (4) sides is mainly built of veined white Italian marble, top-rail and base, corner posts, caps and bases of columns. 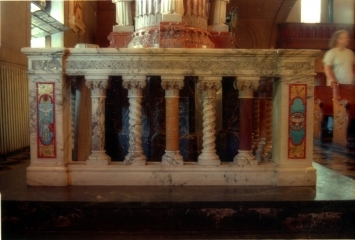 The top rail to have a carved ornamental motif, illuminated with Venetian gold mosaic settings, corner posts rectangular in form to have mosaic panels on two sides with ornamental or symbolic design. The interior of post to be provided with a box for petitions and offerings, having a highly-polished brass lid that opens up on the top of the post. The lid to have a slot and fitted with a lock. The words “Offerings” and “Petitions” to be etched, each word on two lids. The columns and railing to alternate in different colored marbles with two columns on each side to be Spiral type and inlaid with gold mosaic. Colors of marble for columns to be left to the selection of the purchaser. The Platform is to have a riser of black and gold marble and the top or tread in a selected verde green antique marble with a nosing extending over the riser; all to be highly polished and finished. The four Standing Angel Statues around base of Pillar to be carved in pure white Italian Cararra Marble, in graceful position and fine detail. The statue of St. Ann surmounting the Pillar is to be a masterpiece in Sculpture, beautifully modelled and decorated, a duplicate in design of the smaller Statue now at St. Ann’s Church with possibly a richer decoration and finish. This Statue is to rest on clouds that will have concealed lights which will give a special lighting effect to the Statue.